First line: Nothing about this room is real. I received this book earlier in the year, putting it off first by it's far off publication date and then my increasing expectations due to raving reviews. But then I read it and I saw beauty. The characters: Tarver and Lilac were basically our only characters throughout the whole book and I wasn't complaining. They were complex and vulnerable in their own ways, but still strong. We meet them on the ship before the horrific ordeal happens and already, there's tension after she embarrasses him. After, when they're stranded, they don't want to work together, but they eventually do. The tension was perfect. However, the authors were still able to characterize others who didn't even show up, like Lilac's dictator father. The setting: I've never watched Titanic (go ahead, take away some kind of feminine card), but I imagined the ship they were sailing flying? on to be very similar. Full of gowns, drinks, dancing, jewels, and flirting. We weren't there long though when we suddenly crashed with Lilac and Tarver on a mysterious, potentially lethal planet. Gosh, I love sci-fi. The authors do a great job in setting up an unknown world that makes you incredibly nervous, but very intrigued. You're conflicted in wanting them to explore and to stay away. The writing: I haven't read many dual-author books, but if they're all written as well as this one, I will gladly try them out every time. Every other chapter is either Lilac and Tarver so I'm guessing each author wrote one. I didn't have a problem telling the narratives apart even though deep down, Lilac and Tarver were so alike despite their statuses. The story: The authors are also cruel. I know some bloggers who thought the twist and the ending ruined the whole story, but I thought it was great. Sure, it tore my soul and made me question all of life, but it could be considered a small price to pay for such a great book. This may be a tiny detail in the midst of things, but I also want to mention the interrogation scenes. Before every chapter, we're given dialogue between Tarver and what we assume to be Lilac's father's men, an interrogation of the events that happened. I looked forward to it every chapter because it showed more of Tarver's snark and provided more to the story. While it did take me a couple chapters to be invested into the story, it was well worth any wait. 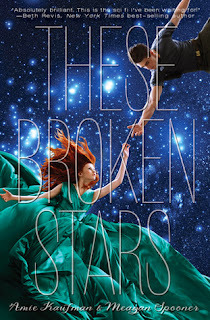 The writing, the characters, the setting, the journey...it all came together to give me an incredible sci-fi experience. 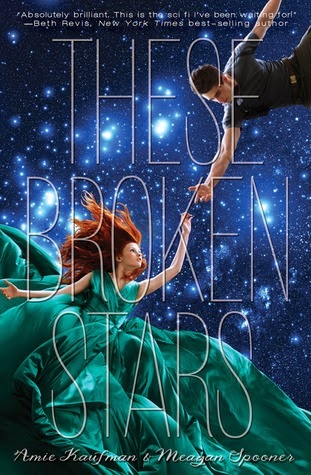 Verdict: These Broken Stars came out this week so if you haven't read it yet, GO. Mystery, twists, romance, adventure, survival, FEELS. Note: Quotes may have changed from ARC to publication. I can see that. I remember at one point, I wasn't too crazy for it, but that quickly went away for me. I think 2014 will be a terrific sci-fi year so I can't wait! Whew. Well, at least I don't feel so lonely anymore. YES. I just stared for the longest time, wondering if that really happened. I do too. I got the book before MAY and waited until October-ish to actually read it. Although, you're in luck, there were quite a few mediocre and negative reviews out there. But I hope you end up loving it! Yay, NOT ALONE! I keep hearing how good this is I need to read it! I'm glad we do! That was the thing about the interrogation...I kept thinking that it HAS to work out because they're speaking...but it was only for Tarver. SPOILER: Okay question…this might be a tad long-winded. So Lilac dies, and then is brought back as kind of a ghost or copy of who she once was. When Tarver took them both through the rift at the end, was the real Lilac (Lilac 1 - non ghost/ non-energy life form Lilac) brought back to life? I don't think so! I think she's officially dead and it's just her ghost that was kept alive! Yay, you liked it! Now I am officially putting a hold on it at the library. I've heard a lot of Titanic comparisons, and that is a bit worrying since that movie is so tragic haha. Love the gifs! I asked for this one for Christmas and I'm looking forward to it! There's definitely a lot of love out there for it! I hope you get it and end up loving it! You should! OH MY GOODNESS. The TWIST. I actually loved the twist, too. These authors took a chance and it paid off big-time. I just got my pre-ordered signed copy and it came with a gorgeous signed poster. I have to go get a frame for it because it's a thing of beauty...I just have to keep myself from re-reading the dang thing for a little bit so I have time. :) Great review! Ooh a poster a signed copy?! Haha, I know what you mean! Apparently, it's like the ultimate chick flick and I'm not the ultimate chick if I haven't seen it! I feel like I'm missing something with this book. I have heard nothing but effusive praise, but when I picked it up, I got to about page 70 before getting bored and putting it down with the intent to come back later. But I did appreciate the interrogation scenes - things like that always appeal to me - and your comment that "the authors are also cruel" makes me way more likely to give the story a second chance. We shall see. I'm glad you liked it so much and I hope the rest of the series does not disappoint you! Aw, the beginning IS slow. Well, I know quite a few people who didn't like it so you're not alone.